I first came across Angela back in the day when she was part of the Kenyan pop group Tattu. Now the former recording artists, dancer and actress is recognised as one of the Top 40 Women Under 40 In Kenya 2017. Lawyer. Chief Executive Officer. Creative. Seamlessly moving from the Kenyan pop charts to the Kenyan National Chamber of Commerce, there is so much to be said about Angela Ndambuki. Here are the 5 Lessons we can take from one Africa’s most 100 Reputable people. If you’re determined to be an entrepreneur, be innovative by focusing on solving a social need. We can achieve this by turning our passions into an activity, not necessarily through a career or employment. As Angela says “…a job gives you an idea of how a business operates in terms of professionalism and development, but it’s not a guarantee of running a business successfully. You can always receive training on how to run a rewarding enterprise though.” The skills we get from our jobs can be transferred into transforming our passions into successful entrepreneurship ventures with the right training to compliment those skills. I strongly believe that consistency is the difference between failure and success and as Angela says “it’s important to go through the steps because that way you learn. Time grows. Wisdom comes with age. Allow yourself the time to just build consistently and constantly. Then when you get to that space you will be the person who has grown into that space unlike being just plucked and put because otherwise you will find yourself struggling and unable to maintain that space.” It is important to consistent in words, consistent in thought and consistent in discipline. This will not only enhance your reputation and results but will give us the experience to be able to rise up and handle any career or business challenges appropriately. I have never heard anyone say “I regret going with my gut.” Have you? It always seems 99% of regret is NOT going with our gut instinct. 10 years after her undergraduate she went and pursued her Masters degree. She is firm believer, regardless what sector, discipline or trade you are in, you should always pursue continued training and professional development. Even as CEO of the The Kenya National Chamber of Commerce and Industry (KNCCI) she engages in continued professional development be it through assessments or training programmes. There is always more to learn. There is always ways to improve and be better. Most people assume that once you reach the top that’s it, but clearly taking a leaf out of Angela’s book one should not be idle and slothful but be proactive and conscious on developing the skills, knowledge and experience gained to enhance their abilities and obviously opportunities in the future. Earlier in her transition from pop singer to lawyer Angela worked for Performers Rights Society of Kenya (PRISK) for 2 years with no paid salary. Whether this was a strategic chess move on Angela’s part I do not know, but what I do know is that in doing this she was bringing value to an industry and organisation which she was passionate about. This I presume was 2 years of learning and networking WHILE at the same time building her reputation and credibility. This brought invaluable exposure for her which has ultimately led to her current success. It could be volunteering for an organisation or offering work to certain clients for free the important thing is to bring value to them which will translate into a strong reputation moving forward. 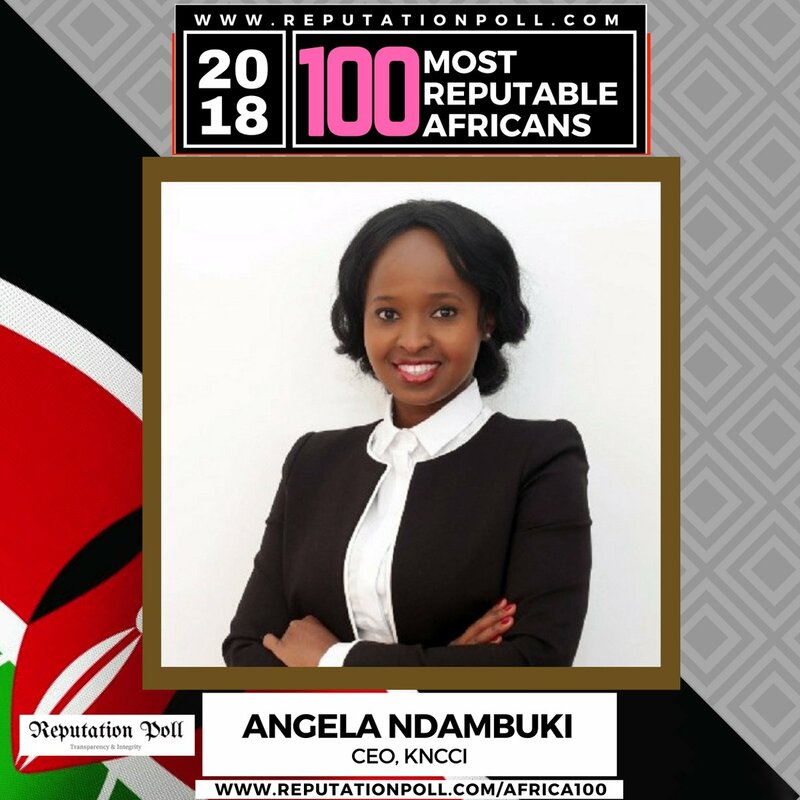 Posted on April 26, 2018 May 8, 2018 by TinashePosted in UncategorizedTagged 100 Most Reputable Africans 2018, Angela Ndambuki, Kenya.